"When Arashi Rikan I died in September 1821 (Bunsei 4) at the age of fifty-three, numerous posthumous portraits were published, reflecting the great popularity of this handsome and elegant actor, particularly among women. This is one such portrait, portraying him as Kiso Yoshinaka, a role he played in 1809 (Bunka 6), twelve years before his death. 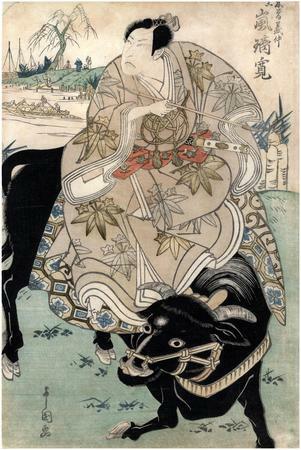 In this scene, Yoshinaka heads for the entertainment district riding on the back of an ox after refusing to ride in a small ox-cart." from the English Supplement to the Ukiyo-e Masterpieces in European Collections: British Museum volume III, page 8. This print was probably produced by Honya Seichichi (Marks 123 - seal 25-527), but the publisher's seal was trimmed off on the left side. "Although Yoritomo became the de facto hegemon of warrior affairs as a result of the Genpei War, the position was very much in contention during the conflict itself. His most serious rivals were members of his kin group, and two of them posed critical challenges to his claim to both clan and warrior headship. The first of these was his cousin, Kiso Yoshinaka (1154-1184) , an ambitious provincial warrior who had been raised in Shinano by a hereditary retainer after his father's death in 1155. Although Yoshinaka's mobilization of troops began, like Yoritomo's, in response to Prince Mochihito's call to arms, Yoshinaka represented a much more immediate threat to the Taira, since he was closer to the capital. The Taira dispatched a punitive force to control him, which he defeated at Kurikara and Shinohara. In 1183, he entered the capital, where he routed the Taira and, according to the Heike, was welcomed as a savior by Retired Sovereign Go-Shirakawa and the central aristocrats. Shortly after his arrival, however, his ruthless appropriation of supplies in the famine-weary capital region, compounded by his inability to navigate the vicissitudes of high-level political life, resulted in his alienation from both capital dwellers and Yoritomo, who feared his cousin's ambitions. With the sanction of the retired sovereign, Yoritomo sent forces from Kamakura to punish Yoshinaka, who died in battle on the shores of Lake Biwa in 1184, little more than six months after his triumphant arrival in the capital The forces defeating him were under the command of two of Yoritomo's brothers — Yoshitsune and Noriyori." Quoted from: Swords, Oaths, And Prophetic Visions: Authoring Warrior Rule in Medieval Japan by Elizabeth Oyler, p. 60. Kiso no Yoshinaka, the present protector of the capital, were rude and vulgar beyond description. Nothing else was to have been expected, of course. What knowledge of civilized deportment could have been acquired by someone who had lived in the Shinano Mountains at Kiso from the time he was two until he was thirty? Quoted from: Heterogeneous Japan: The Cultural Distinctions Between Western and Eastern Japan by Yuko Marshall, pp. 16-17.